To celebrate the 70th anniversary of the Indianapolis 500 victory of the Maserati 8CTF number 2 car driven by Wilbur Shaw, Maserati is proud to present the new Boyle39 polo shirt. 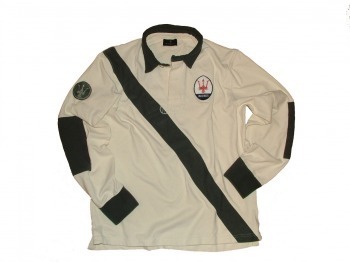 In heavy cotton with strong herringbone braid trims, the Maserati Boyle39 shirt carries unique patches and badges, including: the silver Trident on a grey background on the right shoulder inspired by the one featured on the powerful supercharged 3-litre engine; the name Maserati in 1930s lettering on the shoulders, taken from the official documents of the time; the oval on the chest, identical to the one on the bonnet of the 8CTF, and the number 2, the very number with which in 1939 Shaw won the prestigious American race. The Maserati Boyle39 polo shirt, worn here by supermodel, Maserati racing driver and polo player Jodie Kidd at the Goodwood Festival of Speed, goes on sale today with a retail price of £120. Produced in a limited edition of just 200 pieces – the number of laps completed by the winner of the Indy 500 - it can be ordered exclusively at Maserati dealerships or by calling/emailing Maserati GB direct on +44 (0)1753 878 753 - marketing@maserati.co.uk.